HAVANA, Cuba — As competitors courageously hurled themselves into the ocean at eye-popping speeds at the Red Bull Cliff Diving World Series, various stakeholders shared their views on having Jamaica playing a role in future editions of the event. The 2014 World Series began in Cuba earlier this month and will be followed by stops in Texas, United States and Inis Mor, Republic of Ireland in June; Kragero, Norway and Azores, Portugal in July; Bilbao, Spain in September; and the final event in Rio de Janeiro, Brazil in October. The beautiful, ancient fort at the Morro Castle in Malecon at the entrance to Havana Bay provided a welcoming start to the World Series, as divers, work crew and spectators soaked in the favourable tropical weather. According to some divers, the similarly balmy climes and the renowned scenic coastlines make Jamaica an option worth serious consideration. Orlando Duque, the 2009 World Series champion and the sport’s ultimate poster boy, said he has good memories of leisure diving in the western end of the island. “I was in Negril years ago and I was diving and it’s a great place and there’s beautiful water. I’m sure there must be other places to dive from [aside from Negril]. I was saying before that what I like in Cuba is starting in warm weather. We’ve started previous seasons in cold weather so that’s tough. You want a good start and this is good, so somewhere like Jamaica would be a good starting point,” the 39-year-old Colombian explained. Artem Silchenko, 30, the Cliff Diving Series winner last year, has been to Jamaica on several occasions, working on cruise ships in the Falmouth area of Trelawny. He enjoys swimming in Jamaica, but has never been given the opportunity in the island to do what he loves the most. “I want to dive in Jamaica. I’ve been to Jamaica before, I don’t know how many times, but I think maybe more than 50 times. I know the island and I walk to the beach and it’s a nice place with absolutely friendly people and if they have this kind of dive in Jamaica, I’d be so happy,” the Russian cliff diver told the Sunday Observer. Gary Hunt, the 29-year-old from the United Kingdom, who won three consecutive World Series titles between 2010 and 2012, said he made his first trip to Caribbean waters on his stop in Cuba. But for Hunt, a visit to Jamaica is on his “wish list” and an experience he would “love”. There are questions whether Jamaica has a natural site for a 26.5 to 28-metre — the stipulated event height range — diving platform and there is a school of thought that Red Bull Cliff Diving organisers would want to limit the work required to artificially upgrade a venue. There is also concern that such a venture would have to produce revenue-making possibilities, particularly for the host location and local organisers, if not for Red Bull. Some, however, believe that the Caribbean’s largest English-speaking country and the energy drink company can have an otherworldly partnership. Vivia Newman of Wisynco Group Limited, the distributing company for Red Bull in Jamaica, was one of the thousands in Havana witnessing the cliff divers showcasing artistry and bravery, while splashing into the ocean. She views Jamaica’s possible integration into the World Series as a feasible move. a place like Negril, it would be transformed. 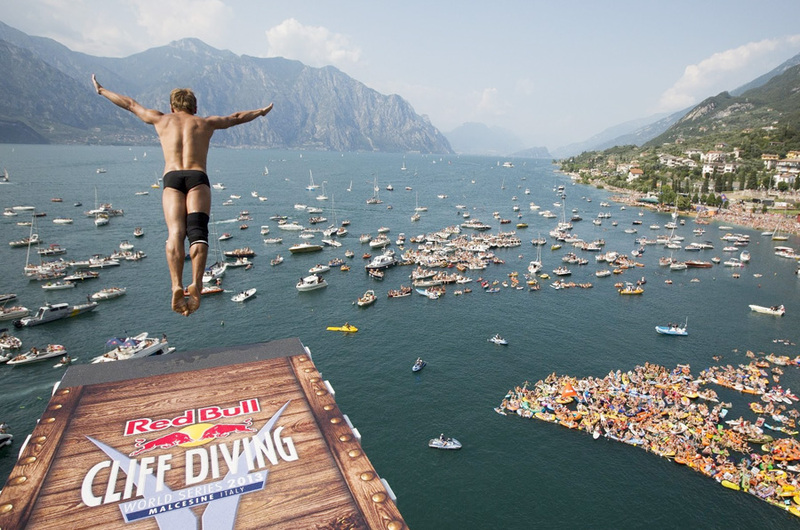 “This is the first time seeing cliff diving and, personally, it’s just awesome. I have not heard any discussions about using Negril, however, I believe it would be an ideal spot and it would bring more tourists to see our beautiful island,” argued Wisynco’s regional sales manager for western Jamaica. Greg Gayle, the senior art director of Nativo branding and design studio, the company responsible for the beverage company’s event logos and graphics, said an informal verbal suggestion has been made to the international director for Red Bull Cliff Diving. “It was a random idea that we threw out. We literally posed the question of what’s the possibility of it. Things need to make sense, not just for us, but for the location we are going to. It was verbal and random, just a chit-chat with the international director for Red Bull Cliff Diving.